Park Tool School Dates added! Check out our newly posted Park Tool School page! 2015 course schedules and registration form are available right on our website. We have restructured our a classes a bit and are proud to offer a few new courses and additional session times! 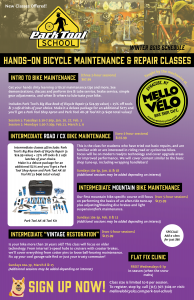 So if you’ve always wanted to learn how to fix your own bike — or know someone who does — now’s your chance to learn (or give the perfect gift for the holidays)!